Hi, I've been having this bug since the early beginnings on Affinity Designer. 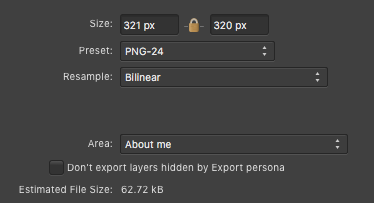 The problem comes when I want to export a square or rectangle selection via CMD+Shift+S, as noticed on the captures, my selections is supposed to be a "perfect square" of 320x320, but as I'm exporting the size varies by a pixel. As carl123 has indicated, this is caused by having objects/artboards aligned to non-whole pixels. You may want to enable Force Pixel Alignment and Move by Whole Pixels to help avoid this in future.